Fooo? Fooo fighters? Fooo man chu? Fooo me once, shame on you. Fooo me twice, shame on me. Fooo me thrice, shame isn’t working, try another punishment. 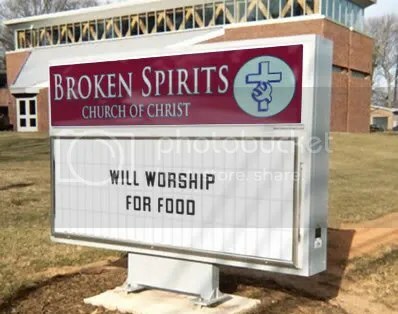 This entry was posted on October 23, 2008 at 1:08 pm and filed under church sign of the day,comedy,culture,entertainment,humor. You can follow any responses to this entry through the RSS feed.